BirdCagePortal.com - Pet Bird Supplies, Parrot Supplies, Cages & Bird Products - GFMDSM - Madagascar Delite - 25 oz. GFMDSM - Madagascar Delite - 25 oz. Goldenfeast Madagascar Delite - 25 oz. is for all medium to large parrots. 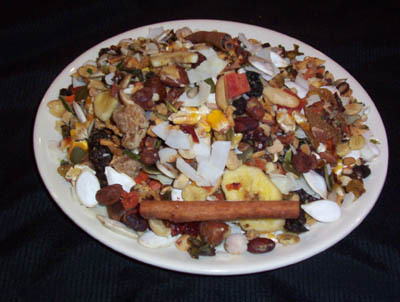 Ingredients: Whole roasted soybeans, shelled almonds, in shell (white) pumpkin seed, dehydrated cranberries, dehydrated bananas, dehydrated corn, shelled roasted peanuts, safflower seed, dehydrated coconut, dehydrated papaya, honey sweetened rolled oats, dehydrated apples, whole sunflower kernels, jumbo flame dehydrated white grapes, dehydrated sweet corn, dehydrated pineapple, whole filberts, whole shelled Brazil nuts, red wheat, buckwheat, whole cinnamon, dehydrated mangos, dried molasses flakes, dehydrated (cooked) black beans, dehydrated carrots, dehydrated peaches, white kafir, dehydrated sweet peppers, dehydrated cherries, dehydrated (cooked) red beans, dehydrated (cooked) pinto beans, whole cashews, sterile hemp seed, pepitas (shelled pumpkin seed), dehydrated (cooked) chic peas, pine nuts, Dried Lactobacillus acidophilis fermentation product, Dried Lactobacillus casei fermentation product, Dried Lactobacillus fermentum fermentation product, Dried Enterococcus faecium fermentation product, and Dried Bifidobacterium longum fermentation product, vitamin-C (as ascorbic acid usp-fcc) and vitamin E (as di-alpha tocopheryl acetate usp-fcc), and natural flavoring.